When writing about beer adventures I often have images that come along with the story. Many times I will couple the story with the image in the form of a tee shirt. If you like the story, great. If you like the image, you can bring it home with you, too. I simply find barrels fascinating. The fact that we can take something as simple as a wood plank, fashion it in a way that can create a liquid-proof container is amazing. And yet, the wooden barrel has been around for some 2,000 years. I guess much of my amusement is that I don't have enough confidence in my own woodworking skills so that I hold this functional art in such high esteem. Beer aged in a bourbon barrel, or any liquor barrel for that matter, gets my attention. I love the complexity that this additional element brings to the flavor of a beer. Of course, working as a professional forester for 40-years helps develop a natural attraction. 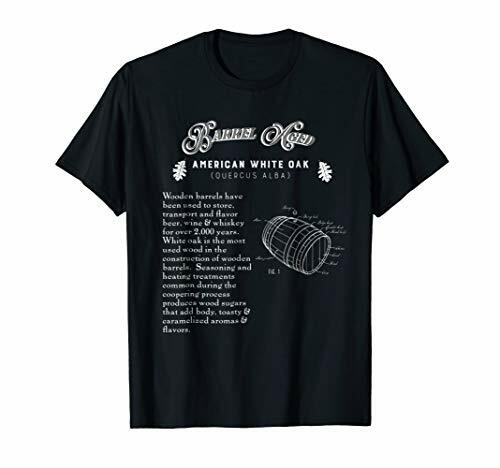 The white oak (Quercus alba) of which most domestic whiskey barrels are crafted from, has been a favorite tree for as long as I remember. Strong, majestic in form, and full of utility. This tee shirt was inspired by the Deep Beer journal post - Bourbon Barrel Genius.